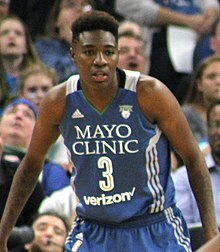 Natasha Howard (born September 2, 1991) is an American professional basketball player for the Seattle Storm of the Women's National Basketball Association (WNBA). She was drafted in 2014 by the Indiana Fever. Born in Toledo, Ohio, she played college basketball for Florida State University, where she finished sixth in the NCAA for field goal percentage. Howard was selected 5th overall by the Indiana Fever in the 2014 WNBA Draft. Howard started off the 2014 season hot scoring 16 points and 21 points in her first two games as a professional. The 21 point performance was a career high in points. After her rookie season in Indiana, Howard averaged 7.0 points and 3.1 rebounds. During her second season with Indiana, Howard regressed in both points and rebounding, averaging 4.2 points and 2.6 rebounds. The only times that Howard scored in double figures were an August 4 loss to the Chicago Sky, when she scored 13 points, and on a September 1 win against the Connecticut Sun, when she scored 10 points. During her second season, the Fever reached the WNBA Finals, where they faced off against the Minnesota Lynx. The Fever ultimately lost the series 3-2, but Howard didn't miss a single shot throughout the entire Finals, going 8 for 8 from the floor in five games. On February 2, 2016, the Fever traded Howard to the Minnesota Lynx in a sign-and-trade deal to acquire Devereaux Peters. During her first season with the Lynx, Howard was part of the post rotation that included Sylvia Fowles, Rebekkah Brunson, and Janel McCarville. She became a key contributor off the bench for the Lynx the entire season. In her first game against Indiana since the trade, Howard scored 11 points, on 5-5 shooting, and grabbed 3 rebounds. She matched her career high of 21 points in a July 2 win against the San Antonio Stars. Howard, once again, reached the WNBA Finals for the 2nd consecutive season, although she fell short once again falling to the Los Angeles Sparks 3-2. In her second season with the Lynx, Howard continued with her bench role, contributing with her scoring and rebounding, helping the Lynx back to championship contention. The Lynx made it back to the Finals, making it Howard's third appearance in the finals. This time in a finals rematch against the Sparks, the Lynx won in five games, earning Howard her first championship. On February 7, 2018, Howard was traded to the Seattle Storm in exchange for a second round pick in the 2018 WNBA Draft. In the 2018 season, Howard would be the starting power forward for the Storm. She would have the best season of her career in Seattle as she averaged career-highs in scoring, blocks, rebounds, assists and steals. Howard would also be named to the WNBA All-Defensive First Team and was second in the league in blocks. The Storm finished with a league-best 26-8 record. They would receive a double-bye to the semi-finals. In the semi-finals series, the Storm would defeat the Phoenix Mercury in five games advancing to the Finals, making this Howard's fourth consecutive finals appearance. In the Finals, the Storm would defeat the Washington Mystics in a three-game sweep. In Game 3, Howard scored a new career-high 29 points along with 14 rebounds. ^ "NBA.com". NBA.com. Retrieved 2017-09-09. ^ Schoffel, Ira (2014-04-14). "Being WNBA's 5th pick is 'dream come true' for FSU star Howard". Tallahassee Democrat. Tallahassee.com. Retrieved 2014-04-22. ^ Woodsdavid, David (2014-04-15). "Fever choose Natasha Howard, Natalie Achonwa in draft". The Indianapolis Star. Indystar.com. Retrieved 2014-04-22. ^ "NCAA® Career Statistics". web1.ncaa.org. Retrieved 2016-05-03. ^ "Fever, Lynx Trade Natasha Howard, Devereaux Peters - WNBA.com - Official Site of the WNBA". WNBA.com - Official Site of the WNBA. Retrieved 2017-09-09. ^ "Storm Acquire Natasha Howard in Trade With Lynx". WNBA.com. February 7, 2018. Retrieved February 9, 2018. Wikimedia Commons has media related to Natasha Howard (basketball). This page was last edited on 25 March 2019, at 17:38 (UTC).